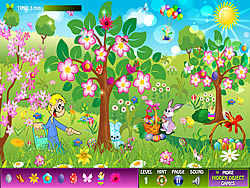 Easter Hidden Objects Game - FunGames.com - Play fun free games. Colorful Easter eggs, chickens on the lawn, the bunnies in the forest... these are the hidden objects in this fun game of Easter. Try to find them in given time and enjoy this charming picture. For each level you have 3 minutes, and in case you run out of time, you can play again starting from the previous level.